This dense, delicious cake is fantastic for any celebration and best of all, all you need to make it is five minutes, a mixing bowl and wooden spoon. Swap the hazelnuts with any other nut you prefer and of course instead of figs, any poached or fresh seasonal fruit would be beautiful here too. If making your own hazelnut meal for this cake, (which will add lots more flavour and texture to the cake), just buy ready toasted nuts and blitz in a food processor until fine, or toast the nuts yourself for 10 minutes in a moderate oven, then rub them in a clean tea towel to remove the skins then blitz. Preheat oven to 180C and grease and line a 24cm cake tin. Combine all ingredients in a large bowl and mix until well combined, pour into the cake tin, smooth the top and bake for 35-45 minutes or until the cake's centre is springy to touch and it's just coming away from the sides. Let cool in the tin for five minutes then turn out to a rack to cool completely. Combine the sugar and water in a small saucepan on medium heat, swirl around a little and then let cook until the sugar has dissolved completely into the water and you have a dark, golden caramel. This will take about five minutes. Remove from heat and whisk in the cream and sugar then set aside. Keep in the fridge until needed and don't worry if it becomes too thick to pour, just pop in the microwave or return to a saucepan over medium heat for a minute before serving and it will pour and drizzle beautifully. 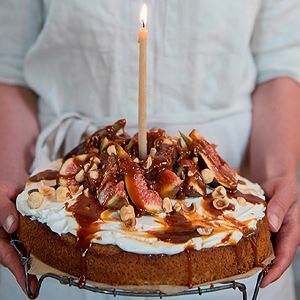 When ready to serve, spoon the mascarpone all over the cake, top with the hazelnuts, figs and finish with a drizzle of caramel sauce. Light and easy, these chicken skewers are perfect for summer BBQs or simple suppers.